Photo by Amanda Bertrand. 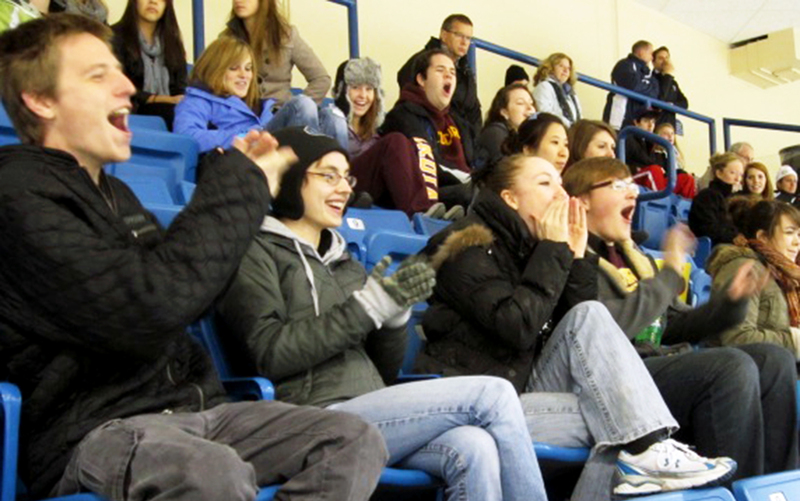 Robert Kwakenat, Melisa Barish, Ruthie Stein and James Stein cheer during a Hockey game last weekend. Barish and Ruthie Stein were clubbies freshmen year, and, while they don’t get to see each other much, they take time out to attend hockey games together. Last Friday at the Moorhead Sports Center was senior night for Concordia’s men’s hockey team, and they did their fans proud by pulling out a 2-1 win in overtime. Somewhere in the stands, cheering on their team with the rest of the crowd, sat two clubbies. Melisa Barish thinks that the Moorhead Sports Center, where Cobber men and women skaters play all of their home hockey games, smells like artificial cold and day-old sweat. But every time she smells it, she can’t help but get excited. Since freshman year, Barish and two of her clubbies, Steph Benson and Ruthie Stein, have attended all of the Friday-night men’s hockey games they are able to, a tradition that has carried on through their junior year. “I had never seen any hockey games until coming to Concordia,” Benson said. According to Barish, it started out as a way to get together and support a fellow member of Club 25 (Survive the Dive). Benson said that she couldn’t remember if it was Barish or Stein who suggested they go, but all three fell in love with the combination of grace and violence in hockey at that first game. Now they enjoy the opportunity to catch up with each other in their busy lives as well. Barish said that during freshman year she, Benson and Stein became close in their Exploration, Adventure & Risk inquiry class with professor W. Scott Olson, where they sat together every day. But after each of them began to follow their own interests and paths, it wasn’t long until they were seeing each other on campus only once or twice, in passing. Stein said that not only did each friend pursue different majors, but they are also involved in different activities outside of class. Barish is an English major, writing for and updating the website for the Concordian, Benson is a social work major involved in choir and Stein is a Chinese and business major involved with the Chinese Club. “It’s nearly impossible to find a time that works for everyone to get together,” Stein said. Except for one. “Friday night’s hockey. That’s kind of reserved,” Stein said. Barish, Benson and Stein said that they love the loud, charged atmosphere and being able to see the same fans at each game and catch up with what’s going on each others’ lives. Barish said that their shared enthusiasm for Friday-night games has helped them of them stay close. “I really enjoy going to (hockey games) and cheering on the Cobbers and having a good time with Ruthie and Melisa,” Benson said. Last Friday, Benson wasn’t able to make the game due to a previous engagement with the Concordia Theater’s production of “Into the Woods,” but they’ll all attempt to make it to the next home game together. “We certainly can’t make it to all of them, but we try,” Stein said. Cobber men’s hockey isn’t home again until December, but if you make it, keep an eye out for a trio of girls seated just behind Cobber Nation. Don’t get upset with them if they chat together during the game, it’s the only time they have to get together as happy Cobbers.